I was pretty tired on Monday evening and all i wanted to do was curl up in front of a movie with a big creamy bowl of pasta. Sadly, this was not to be. After an extended and heavenly break from the gym whilst we were in Boston and then over the weekend, me and Hayls were finally dragging ourselves back to the gym. As we always get back just before dinner, i needed something that i could prep mostly in advance and then just get Alex to finish off. 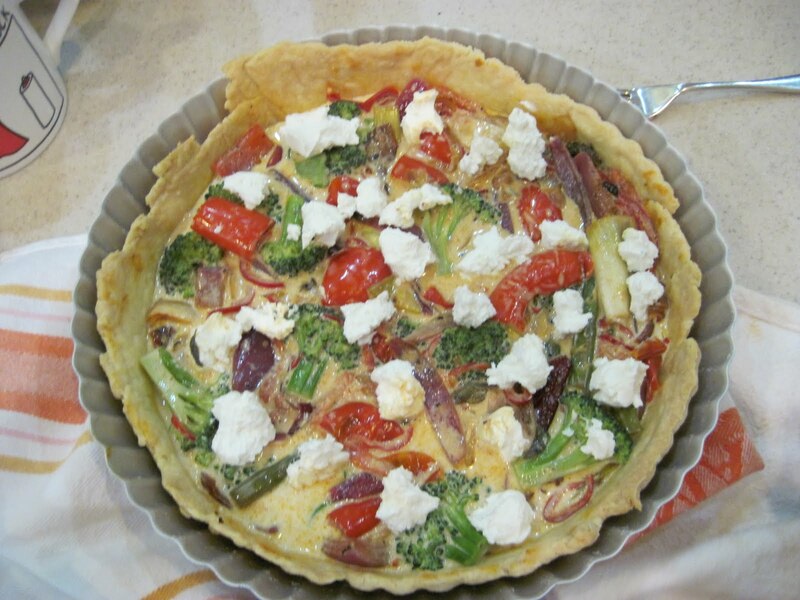 Quiche is what popped into my mind, namely a roasted vegetable and goats cheese quiche. It’s something that feels indulgent and comforting but when you pack it full of veggies and have it with salad it’s actually not too bad. And it tastes good, which is what we’re really after.It’s also light enough for spring, as much as I love hearty, rich dishes that make you dream of curling up by the fire, it’s no longer so appealing once it’s hitting 90 degrees so we have to go for something that still gives you the comfort level, just minus the stodge. The other great thing about a quiche is that you can really put absolutely anything in it. It’s a good way to use up scraps of whatever’s knocking around your fridge looking lonely and a bit neglected, you just swathe it in a coat of cream, egg and cheese, and there you go, you’ve made something pretty damn luxurious. Having said that, you do still have to think of what will taste good together, i wouldn’t recommend hurling in absolutely everything that’s hanging around the veg drawer and hoping for the best as you might just end up ruining it. Combine the flour and salt in a bowl and rub in the butter until it looks like wet sand. 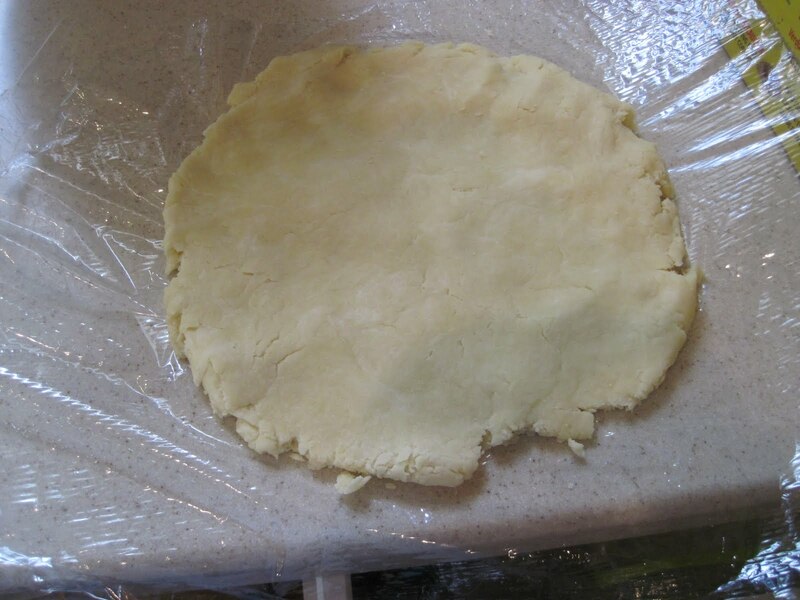 Add enough water so that the dough forms a ball, then flatten out into a disc, cling film and put in the fridge to chill for about 30 minutes (or longer if you need to). Everyone usually says to put it into the fridge in a ball but it chills much faster and more evenly if you flatten it. When it’s ready, preheat the oven to 180C/350F. 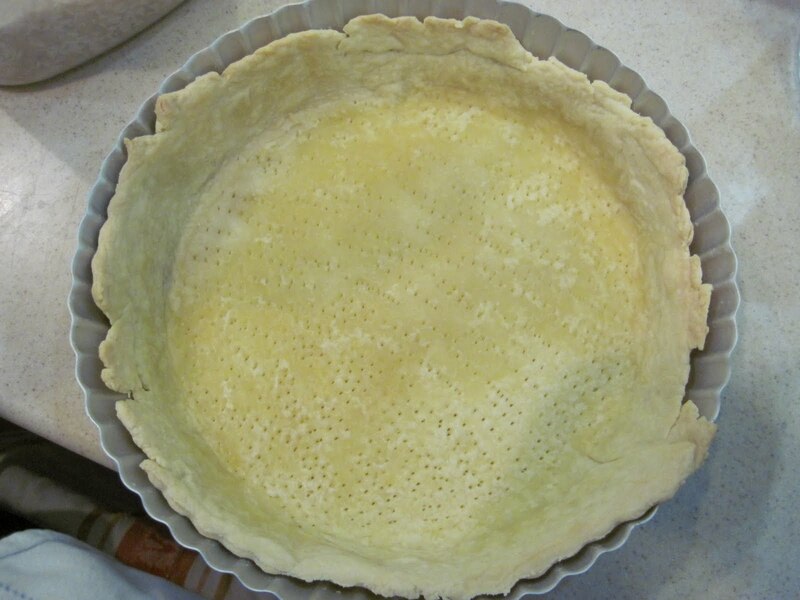 then roll out the pastry and line your tart case. Prick the base all over with a fork and then put it back in the fridge for 10 minutes. Once it’s chilled out in the fridge again, line with parchment paper and fill with baking beans or rice, anything that will weight it down basically. I am aware that i’ve used tin foil here but we’d run out of parchment so i had to make do with this. 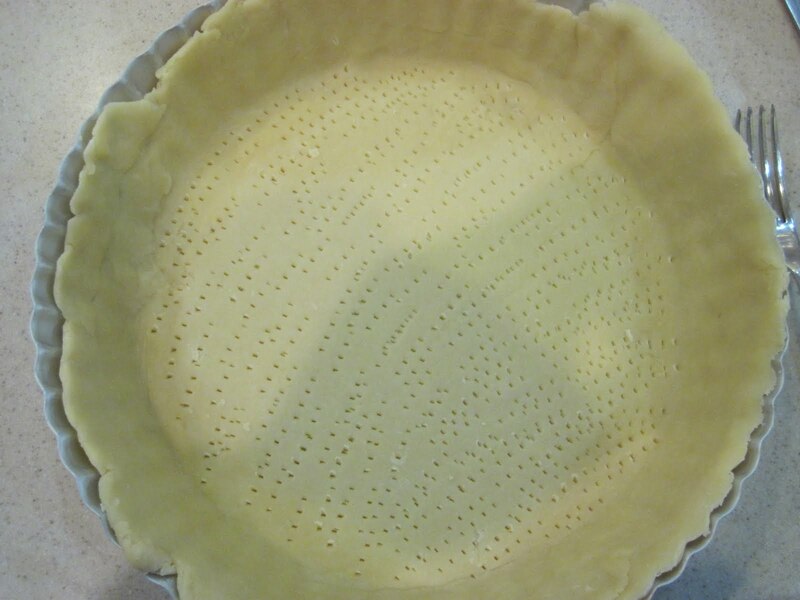 The point of pricking the base and then weighting it down is to stop the pastry shrinking down the sides of the tin, which it just loves to do. This is called blind baking and if you skip this step you’ll just end up with a sad, heavy lump of pastry in the bottom of the tart tin and there’ll be nowhere for the filling to go. That doesn’t sound so tempting does it? Then pop it back in for 5-10 minutes until the bottom isn’t looking doughy anymore. And that’s the pastry done, not so difficult. Shortcrust pastry is the easiest one to make as it’s the most forgiving. If your pastry tears as you’re rolling it out or filling the tart tin, it doesn’t matter. Simply rip a bit off from somewhere else and patch it, it’ll forgive you and, once the filling is in, no one will even be able to tell. Alex had to do it on this tart when he rolled the pastry out for me as the dough had been in the fridge for quite a while and was really cold when it came out. Although the crust is all uneven, as you can see, it doesn’t matter, it’ll still taste delicious and it proves that it’s homemade. Throw the word rustic around a little bit and no one can say a word about what it looks like. 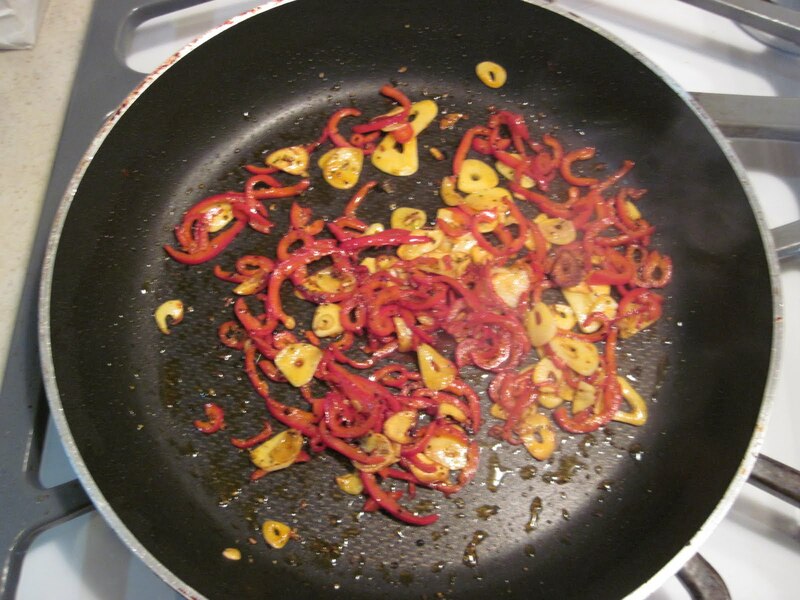 Anyway, on to the filling…. Ok, first things first, preheat the oven to 160C/320F. Snap the ends off the asparagus- grab hold of each end and bend, the asparagus will snap naturally where the sugars have built up and therefore just leave you with the good bit. 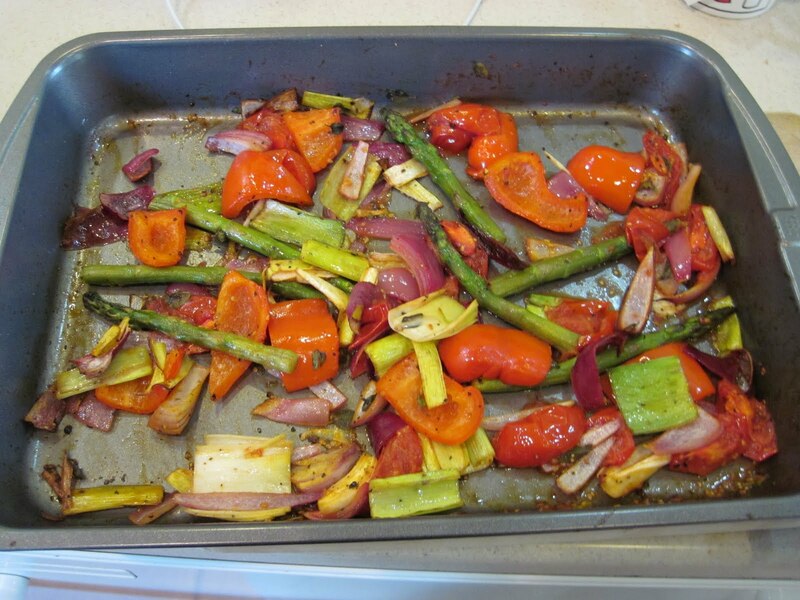 Then chuck the tomato, pepper, leek, onion and asparagus into a roasting tin, add a glug of olive, some salt and pepper and give it all a good shake about. Bung it in the oven for about 30 minutes until everything is just beginning to caramelise. 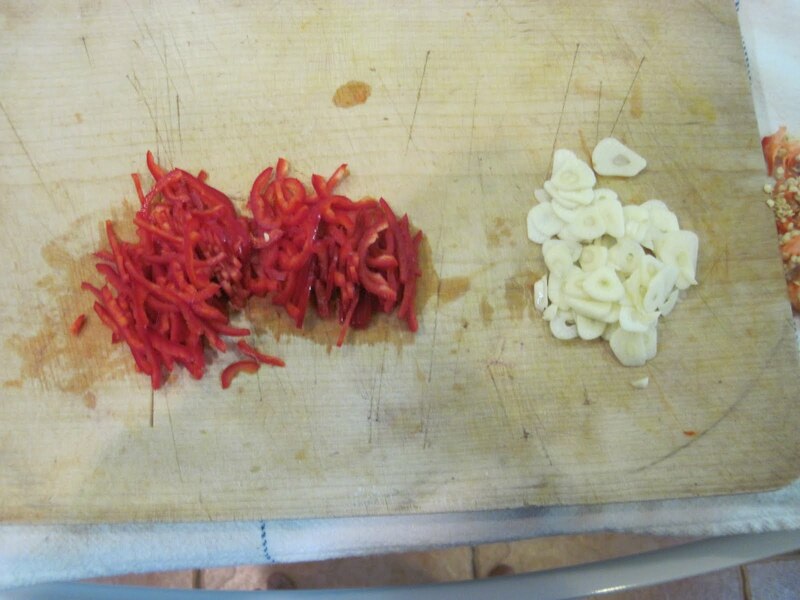 Next up, deseed your chillis and slice them, and, whilst you’re at it, slice the garlic too, then fry it all in a pan until the garlic is very lightly golden. Next, whisk together the egg and double cream, and now, i think we’re ready to put this bad boy together. 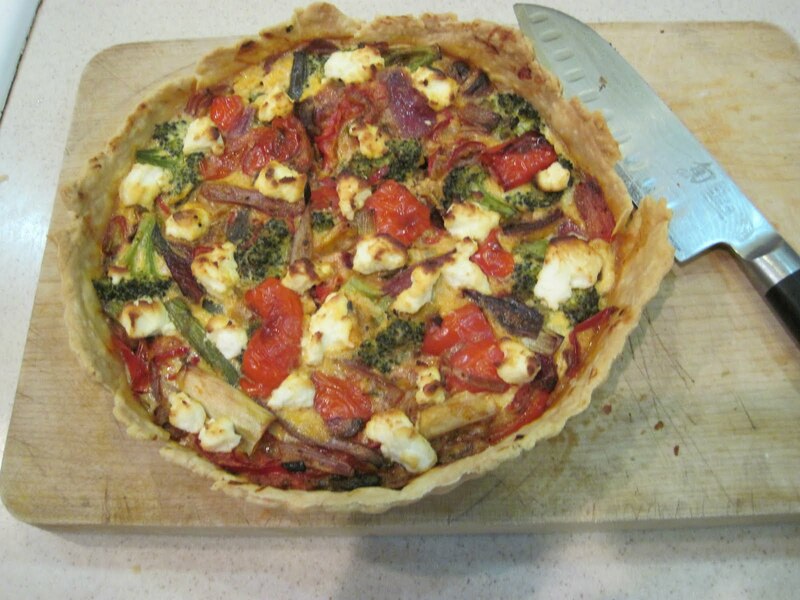 Put the roasted veg mix, the chilli, garlic and broccoli into the tart case. Make sure you get a spatula and scrape out the roasting tin as there’s lots of yumminess to be had in there. Pour over the egg/cream mix and give the whole lot a little stir around so everything’s nicely coated. Press it all down so you have a fairly even layer and then dot over the goats cheese so it ends up looking like this. 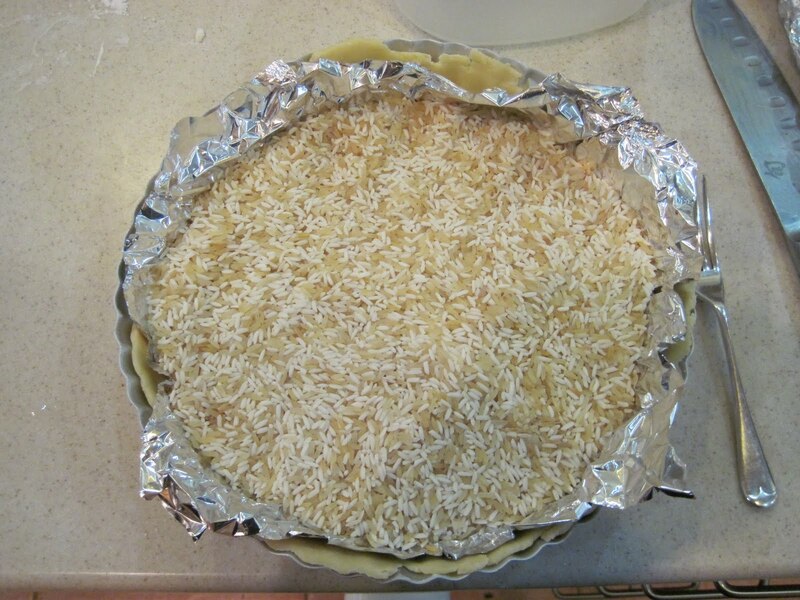 Pop it in your still hot oven for about 30-40 minutes until the filling is set and the top is golden, if it starts to colour too much on the top, whack a bit of tin foil over it. Hopefully, it’ll end up looking something like this. Cool on a wire rack for 10 mins and then transfer onto a board or plate to serve.I like to just plonk this down on the table with a big green salad and a bottle of wine and just let everyone help themselves. This isn’t supposed to be anything snazzy, just relaxed and tasty, which is just how it ended up. It’s also such a nice way to eat if you’re just with a group of friends, there’s nothing worse than having to have a big formal meal when you’re just feeling tired and lazy and it also gets everyone talking. In short, it’s a bit of midweek perfection. So if you fancy a change one night then give it a whirl.